At OSI 11-14 Short Course Championships in Corvallis Feb. 22-25, Lexi Williams won four events, and finished top three in two more. 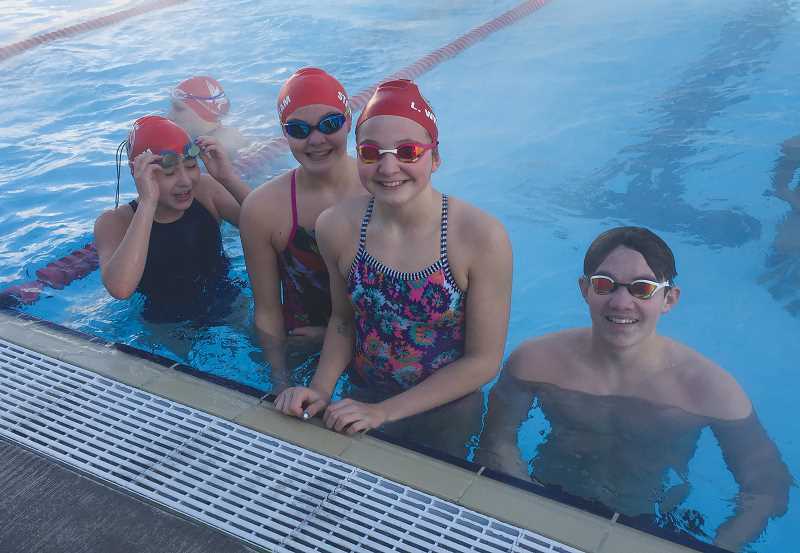 Four Madras Swim Team members went to the OSI 11-14 Short Course Championships in Corvallis Feb. 22-25, and when all was said and done, MST improved personal bests in all 18 events it was entered in. Leading the charge was 11-year-old Lexi Williams, who won four freestyle events, and also placed second in the 50 butterfly with a time of 29.70 seconds, and third in the 100 IM (1:07.77). She dropped time in four wins — the 50 (25.87), 100 (56.45), 200 (2:02.54), and 500 (5:37.54) free. Williams is now ranked in the top 30 nationwide among 11-year-olds in all of her freestyle events, aside from the 500. "I was really happy with the 50 free," Williams said. "When I saw the 25 on the clock, I was not expecting that." Likewise, Julian Hollingshead set new PRs in all six of his events, highlighted by a fourth-place finish in the 100 breaststroke, in which he dropped to 1:05.40, three-and-a-half seconds better than the time he had coming into the meet. "I did a lot better than I thought I was going to do," Hollingshead said. "I was thinking I was going to go a 1:07, maybe." "By far, that was the most competitive event," MST coach Tim Nelson said. "All eight kids had just amazing times for that event, for a 13-year-old." Both Hollingshead and Williams have a little under a month to train for the Northwest Region SC Age Group Championships, taking place in Federal Way, Washington March 22-25. Hollingshead, penciled in to swim the 200 breaststroke, said he wants to focus on his technique between now and then. Williams aims to improve on her flip turns for each of her four regional events — the 50, 100, 200 and 500 free. Elli Williams competed in the 50 and 100 freestyle, and in the former event, clocked a 27.10, a marked improvement from earlier this season when she earned a state-qualifying time during a last chance meet in Madras a few weeks ago. "I was really proud of my sister, because she's been working so hard to get that 27," Lexi Williams said. Kami Ackley dropped nearly two seconds off her 50 fly time, dipping below the 32-second mark, just missing out on finals. She also clocked faster times in the 50 and 100 free, as well as the 50 back. "She's got a bright future; she's a strong girl," Nelson said. Following regionals next month, MST will kick off its long course season in April.